The Indianan foursome lets off a stream of slick Rock tunes with a Punk underbelly and Pop overtones. Between albums, the band manages time to foster real lives and earn advanced degrees while maintaining individual careers in teaching and publishing. Between breaks, they play and record for other like-minded scenesters as Screeching Weasel and The Mopes. Thus the six year hiatus between recordings for the band that began back in '93 and made impressive advances in their short but sweet presence, tracking tunes for film credits and the Fox network. So the point here is that Squirtgun doesn't band together for the love of living six strong in a crowded van or make some apolitical statement aimed at better living through the death of the Republican party. Personal tastes aside, this music is tasteful and playful and mostly fun. The lyrical themes range from adolescent lust to grown up romance, from the opening bass-churn of "Never Fit" where "so may bright-light people end a whole lot dimmer," to songs of infernal love, "Burn For You," "Model Builder," and "Kiss Your Language." There's a catchiness and frivolity within the sound that recalls the stylized Punk/Pop/Emo prototypes like The Ataris, Useless I.D., Blink 182, Big In Japan, Screeching Weasel-- the list goes on. "Trial & Error" emerges as the heavyweight favorite here, written by BIJ's Damon, it's a potent tune wrought with harmonics and addictive chorus before stepping aside for the quickened intensity of "Me Without You," and the can't miss teen drama style anthem "Apt. 3." 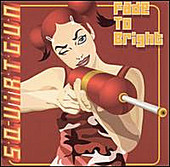 "Fade To Bright" is just what the title indicates; an uptempo style record of fourteen tracks and fifty minutes of melodic Pop tunes with a Punky edge that radiate a feel good vibe that's more serious than silly and safe listening for all ages.